We here at LexPredict are pleased to announce that we have partnered with Exigent, a world-class provider of outsourced legal and tech services. Our goal is to provide comprehensive, cutting-edge, and customized contract management solutions to clients. Unlike many other offerings in the market, our partnership with Exigent provides clients with access to a complete team of legal and technology professionals and assets at scale. No matter whether agreements start out on paper, in Salesforce or Outlook, or on a shared drive, clients can rest assured that their contract assets will be structured and sustainably managed going forward. 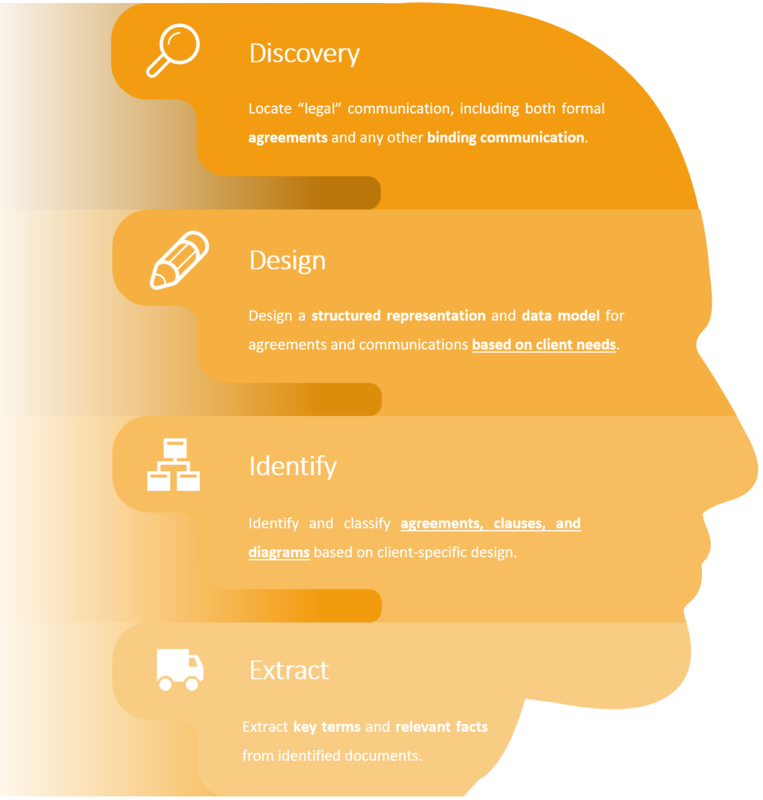 As with most modern contract management solutions, our services rely on natural language processing (NLP) and machine learning (ML) technology to automate the identification, classification, and extraction of information. We emphasize two key departures from the norm, however, in the process we use. Where are you contracts today? Do you know? We often approach work with an ideal of perfection. We want our corporate client to have such an effective document management system that contains every agreement, and we want no salesperson to ever have to email a client. Unsurprisingly, we don’t see that kind of organization too often. We also often see a company that doesn’t know where any of its agreements are, or that doesn’t seem to care if they’re in Salesforce or Office 365. People at this company might just tell clients, “give me a PDF and I’ll tell you what the commercial terms of that lease are”. But we all know this isn’t really what the client needs. And this sort of approach isn’t a good fit for most real-world applications. Most of the time, if two companies merge or a salesperson leaves, all you have left is their laptop or a Google account. All you really need is for someone to go through and find all of their agreements. Otherwise, you might have a situation where you’re bound to terms in the body of an email, and didn’t realize it until it was too late. Our contract management solutions start from the top, including advanced contract and legal communication discovery tools. Whether you need OCR, email discovery, or shared drive search, we ensure that every relevant communication is located and included in subsequent analysis. For example, some products allow users to train new clause identification or classification rules. Users can then teach the system to identify a new clause type. But how do we find time to teach? And how will the user know when their new “pupil” is ready to graduate to “production” usage? Exigent’s team of experienced and expertly-trained reviewers can answer these questions. They make the effort and complexity of this customization completely transparent to the client. Whether the client needs custom discovery and classification, or extraction of emails, agreements, or clauses, we work together with data scientists, software developers, and legal professionals to make it happen. Now imagine you’re a GC who invests in customization of your contract management solution. You allocate hundreds of your team’s hours to coding and training a software product, and it works perfectly. Now what? What if your software vendor goes out of business, or jacks up their rates, or even worse, re-sells the product to your competitors? When you trained their system, you effectively donated valuable intellectual property to them. You should be able to decide how that intellectual property is used. We are acutely sensitive to this issue. And our goal is to work with clients to make sure they have a say in the ownership and management of intellectual property related to contracts. At the end of the day, our driving vision at LexPredict is that man and machine together are better than either alone, and we’re very excited to be working with the men and women at Exigent to bring this vision to legal departments around the world. While many vendors sell licenses for fragile “artificial intelligence” that frankly does not exist, we are focused on delivering solutions to pressing business problems using the best blend of resources and technology possible.